A key Foreign Office (FCO) report has praised the suspended former ambassador to Uzbekistan for drawing attention to human rights abuses in the country. Craig Murray highlighted the case of the imprisonment of the mother of a man apparently tortured to death with boiling water in 2002. 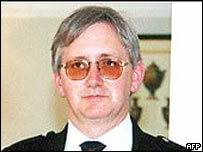 He also criticised use of intelligence obtained under torture in Uzbekistan. Jack Straw refused to comment on Mr Murray's case but agreed there was concern about abuses in the country. The annual FCO report on human rights says the dead man Muzafar Avazov's mother, Fatima Mukadirova, was subsequently imprisoned "we believe...for publicising the case of her son". It goes on: "Our ambassador to Tashkent Craig Murray publicly criticised the Uzbek authorities' handling of Mukadirova's case in BBC media interviews. We believe this played a significant role in bringing the case to the attention of the international community. "...we subsequently welcomed her release... following the reduction of her penalty to a fine." Mr Murray claims he was recalled from his Tashkent posting because he criticised the use by the UK of intelligence obtained under torture in the country. The Foreign Office has said the decision was "operational". During a news conference in central London Mr Straw outlined some of the wide range of areas where Britain had worked to try to improve human rights records. He said that respect for human rights often boosted a state's stability. Mr Straw said help from the UK ranged from tackling countries on their use of the death penalty through to trying to provide practical help on humane methods of incarceration. For example he said 40,000 copies of a prison manual had been distributed in Brazil alone. On the issue of Uzbekistan Mr Straw said human rights remained the biggest issue in the country. "The government in Uzbekistan has continued to use the fear of Islamic terrorism, so called, as a pretext for the oppression of opposition groups," said the foreign secretary. "We remain extremely concerned at reports that prisoners have been tortured to death in custody." Until "real practical improvement in the situation" was achieved human rights would remain the main issue in exchanges with the country. The Foreign Office confirmed some time ago that Mr Murray was suspended, despite earlier statements that he was not facing disciplinary action. Mr Murray said he became a "victim of conscience" after a memo in which he claimed MI6 had used information obtained under torture. The FCO has said Mr Murray had lost the confidence of senior officials and colleagues. Who violates human rights the most?